This article shows how the ActionFilterAttribute class can be used in an ASP.NET Core 2.2 MVC application. The ActionFilterAttribute class is an implementation of the IActionFilter, IAsyncActionFilter, IResultFilter, IAsyncResultFilter, and the IOrderedFilter interfaces. This filter can be used as a method filter, controller filter, or global filter for all MVC HTTP requests, or more precisely an ActionFilterAttribute can be used directly, as a ServiceFilter, as a TypeFilter, or in the Startup class. The ServiceFilter class can be used to apply the different custom attribute implementations in the controller classes. By using the ServiceFilter, it is possible to use constructor injection using the application IoC. This is great improvement compared to the the previous version which forced us the use property injection for child dependencies or to add the dependencies directly. In the following examples, custom implementations of the ActionFilterAttribute are used which implement the four synchronous method which can be overridden. The ILoggerFactory is used to log the method calls which is added to the custom action filter using constructor injection. Because the filters will be used as a ServiceType, the different custom filters need to be registered with the framework IoC. If the action filters were used directly, this would not be required. The different custom filters are added to the MVC controller method and the controller class using the ServiceFilter attribute. The action overrides are executed first, then the result overrides. The class filter wraps the method filters. The custom implementations of the action filter can also be added globally in the ConfigureServices method in the startup class. The is not added using the framework IoC here, so the loggerFactory is created and added manually in the AddMVC method via the config options. The global filter is wrapped outside of the controller class filters per default. The action filter can also be applied to child and parent MVC controllers. The action filter on the child controller is wrapped around the base controller. The execution order in the HTTP request can also be set when using an action filter which is a great improvement compared to Web API. 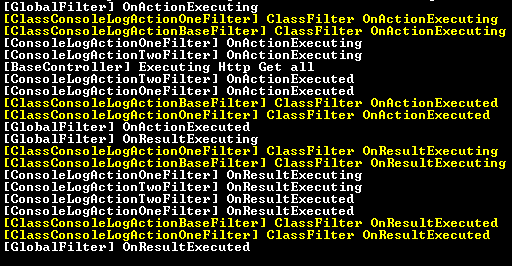 The action filters with the highest order value will be executed last. It doesn’t matter if the filter is defined on a class or on a method, if the order properties are different, this property will be used. By using the order property on a filter, you have total control. This is great to have, but I would avoid using this if possible and stick to the conventions. I would try to design the application so that the usage of the order is not required. The execution of the HTTP request is controller by setting the order of the action filters. You could also use the ActionFilter directly or as a TypeFilter. See Filip WOJCIESZYN’s blog for a detailed description of this. Do you know the difference between Filter and Middleware ? All of the code executes w/o err but i never see a console window. How do I get the console to open?